Our penguins can do a lot of things, but flying through the air is not one of them. (Unless you count porpoising as flying! Visit this blog post to learn more and see video of this nifty penguin behavior.) While flying birds have hollow bones, penguins have bones that are solid and heavy and that helps them dive underwater. Also their wings are smaller compared to birds of flight. This reduces drag when the penguins are swimming underwater. But penguins swimming underwater certainly look as if they're flying! 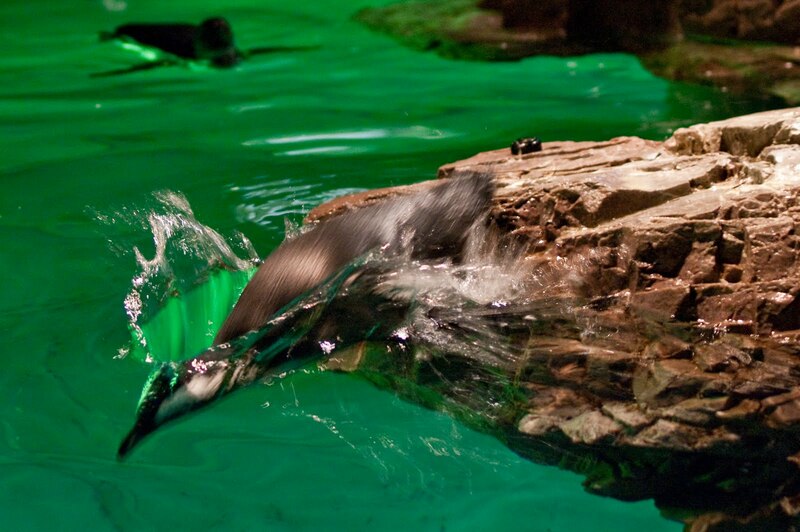 Watch as the penguins flap their wings propelling themselves through the water. Come visit the Aquarium to see our new and improved underwater camera at the Penguin Exhibit to watch penguins torpedo through the water!